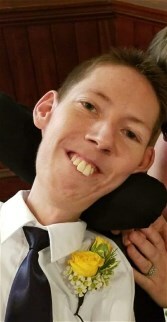 LOUISBURG – William Tyler Wester, 26, of Louisburg, transitioned peacefully Sunday night at Wake Med. Tyler was a loving son, brother, uncle, cousin and friend. He was a 2009 graduate of Louisburg High School, graduating as a junior. A person of wisdom beyond his years, he enjoyed his music, movies, television series, Live PD, SnapChat, Clash of Clans and texting his friends. Tyler had a warm smile, great sense of humor and wit. He loved his family, caretakers and friends. Tyler will always be remembered for his courage and determination. He was a fighter and was an inspiration to everyone who knew him. A celebration of life will be held 2 pm Thursday at Louisburg Baptist Church. Entombment will follow in Lancaster Memorial Park. Tyler is survived by his parents, Betty-Lynn and Tommy Wester of the home; sister and brother-in-law, Katy and Joe Terenyi; nephew, Benjamin Terenyi, all of Raleigh. In lieu of flowers, the family requests that memorials be made to Louisburg Fire Department Maude Fund, 102 Wade Avenue, Louisburg, NC 27549 or to Cure S.M.A., 925 Busse Road, Elk Grove Village, IL 60007. The family will receive friends 6-8:00 pm, Wednesday at Strickland Funeral Home & Crematory, Louisburg, www.stricklandfuneralhome.net.